I had joined this awesome platform of bitlanders about 2 months ago, I had heard about bitlanders in one email from one of my favorite subscriptions. There were also 3 more social sites, that were active in these days and still are. Actually i had joined those 3 social media sites, but working there for about a month i thought to quit. Cause these sites have no any interesting feature to be enjoyed. Afterward i searched again and again for online social media to be joined, which would be interesting for me to work on. One day while sitting alone, an idea came in my mind about bitlanders.com, and thought to give it a try. I Joined this awesome socail media site. Started working here for few weeks, but i could not understand how bitlanders.com works for me. As i had no friend to guide me about bitlanders.com. Than i started to send message to adgoggleko (the number one rank holder in the bitlanders), she is very nice person and friendly, she guided me about some features and gave me tips to get good rank. I also read many blogs of minato, ako-eto, abid-khan,soari-sam (these are also rank holders too), i read their blogs with four and five stars. Visiting these all blogs made me crazy about writing. This is why i am writing this blogs for my newbie friends, who may join this amazing social media site, and gain benefits without wasting their time and talent as well. The main person you should follow on the bitlanders is micky-the-slanted-salerno. You are familiar with this person. As He has guided you, when you signedup on bitlanders.This person will guide you through his blogs, he will also let you know, what is trending and what should you post about, that favor you more. You must subscribe this person if you want to get updates from bitlanders. micky-the-slanted-salerno has many powerful blogs for you. If you just have joined bitlanders, i will suggest you to read his blogs first. I like his blog, which is about how to gain buzz, followers, and reward. Here is the link http://www.bitlanders.com/blogs/promote-your-content-to-gain-buzz-followers-and-more-rewards/3479644 ..
Another blog of micky i like the most and it helped me a lot, so i thought to share link with you. here is the link. http://www.bitlanders.com/blogs/bitlanders-how-to-guide-how-to-earn-redeem-rewards/3305951.There are many other blogs to let you know more about bitlanders. Let us come to the main page and have a look over the main page when you log in to bitlanders. What features of option you will have to deal with? This is here to let you know about them. The red circle and red arrow notifies you about the homepage icon. 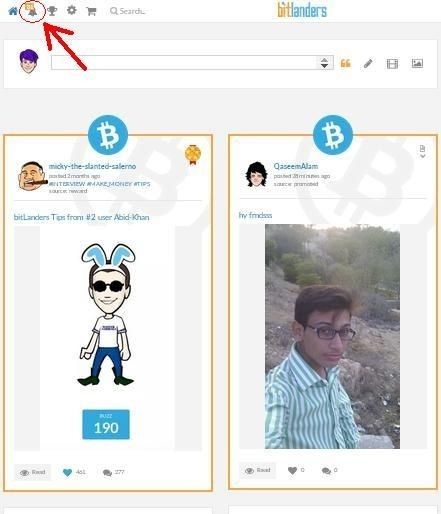 The homepage shows all the latest content posted by bitlanders, the promoted content by the users or reviewed content. I will tell you more about the review option later in my blog. This is the page you will see every time you login. On the next to homepage icon, there is icon of notification. Notification notifies all the users about the mentions content buzzed or replied by the members. This is also a nice feature of the bitlanders, where one can easily find the person, who has liked or replied his content. As this would engage users more to each other. In this way users have an idea, that which content is buzzed more simply means liked more or trending. Now coming to another option, that is the most important and eye catching for every bitlanders user. It is leaderboard or chart. As everyone wants to be a part of this leaderboard and is struggling hard for this race. I am also one of them to be a part in the leaderboard. I have been successful in my 2nd month after joining bitlanders. Next to the chart icon, there is setting option. This tab option has many drop down manu options. which are shown below in the picture. This drop down manu has many option starting from leaderboard, you are already familiar with leaderboard. Then it is charity leaderboard. This is the leaderboard or chart for top charities. You can find which charity receives more funds. After charity leaderboard there is more interesting option, which is inventory. 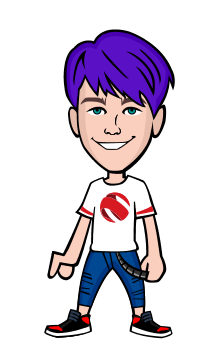 In this option you can dress up your avatar and get some gadgets and accessories for your avatar. 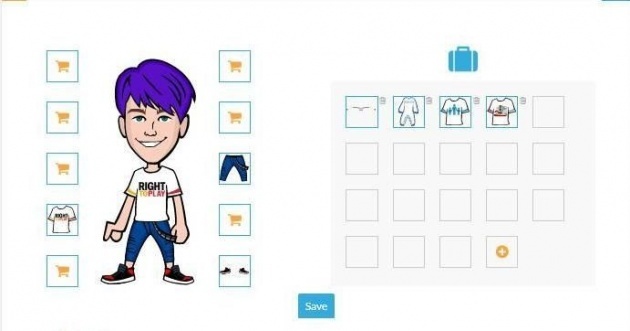 In this inventory option there are many options for you to dress up your avatar as cool as you want. This is all done through the shop option. If you have enough money or gems, then you can make your avatar look cool. Inventory will also show you your daily earnings and buzz score as well. Here you can find your daily earnings and all time earning as well. As that will help you to focus more on your content. Below the daily earning option there is main feature of bitlanders, that is called BUZZ. Here you can see two lines divided by two colors. One is yellow and other one is blue. Blue color is the bass buzz score and yellow color is your daily direct power ups. Base buzz score is the main score you would be struggling here on bitlanders. How can one get more base buzz score? This is the first question that arises in mind. The base buzz score is the score you can get by writing your content, blogs, microblogs, engaging other users to your content and sharing content of the other users. This is what the whole game is all about. If you want your score increased then your first step should be to write your original content blogs, post your original videos and gallery on bitlanders. Then other step is to follow some good users who may appreciate your hard work and engage them everyday in your content. Here is the snap and a video for your guide. Now coming back from inventory option there is next option My content flow. This is the feature where you can find that who has been engaged with your content. As this is also nice option to have a look over your content. Now there are main four options My Videos, My Blogs, My Microblogs and My gallery. These four options are the main source of your buzz score. The more original and interesting content you post higher you get your buzz score. Next to them there is a INBOX. This feature has helped me a lot. Cause in my starting days on bitlanders i could not understand this platform. I started to become familiar with this site by sending messages to the top rank members, some of them did not replied me, but some are nice. They helped me a lot here. This is why i grew up and reached 8th rank once. Now coming to other option that is EARN MORE. This is what every user wants this feature on his most favorite site. This is the option where you can find your referral link and send it to your friends and family or post it to social sites to get referrals for bitlanders.com. 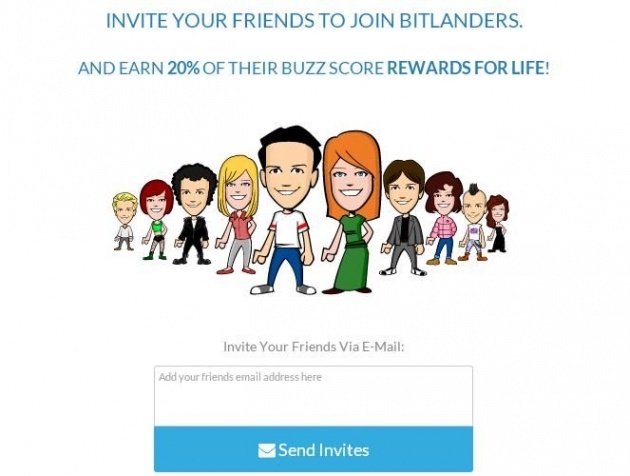 Bitlanders currently giving 20% of their buzz score as reward for life. This is the main benefit one can get here on bitlanders. 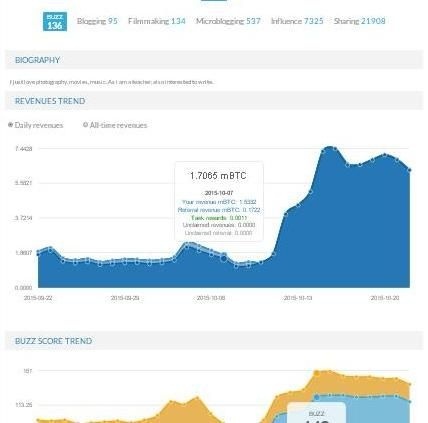 This is really appreciating work of bitlanders. You can send your referral link to your friends on social media sites or by sending them a mail as well, this is very simple. Now there is another option called My Rewards. Here you can find your Balance and all time earnings as well. 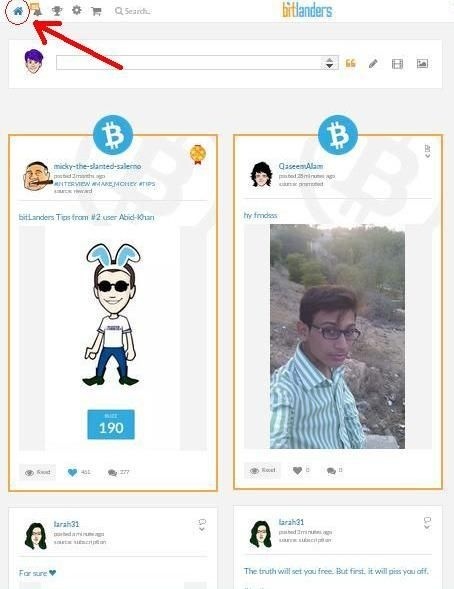 You can also use your earnings for shopping for your avatar or you can use your earning for bitcharities as well. You can also withdraw your earning to bitcoin wallet like blockchain.info, if you do not have blockchain wallet you can click the link to have one now. If you want detail about your earnings and reward then you just need to click detail button. After reward option there is preferences option, where one can manage his account like email address, password, notifications and charities. The most important part for a newbie is to read all FAQs. All the doubts of the newbie would be destroyed by reading this FAQs section. The content of this blog are copyright to ric4iqbal2. Buzz & sub me back. Buzzez ME Back reply thanks!